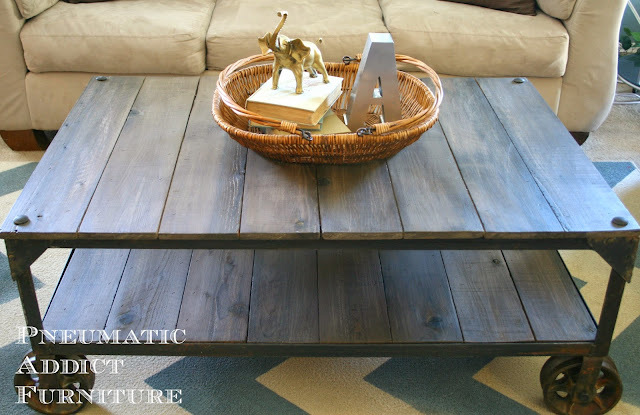 If you are like me, then you love the current trend of just about everything made from reclaimed or barn wood. If you are also like me, you A. 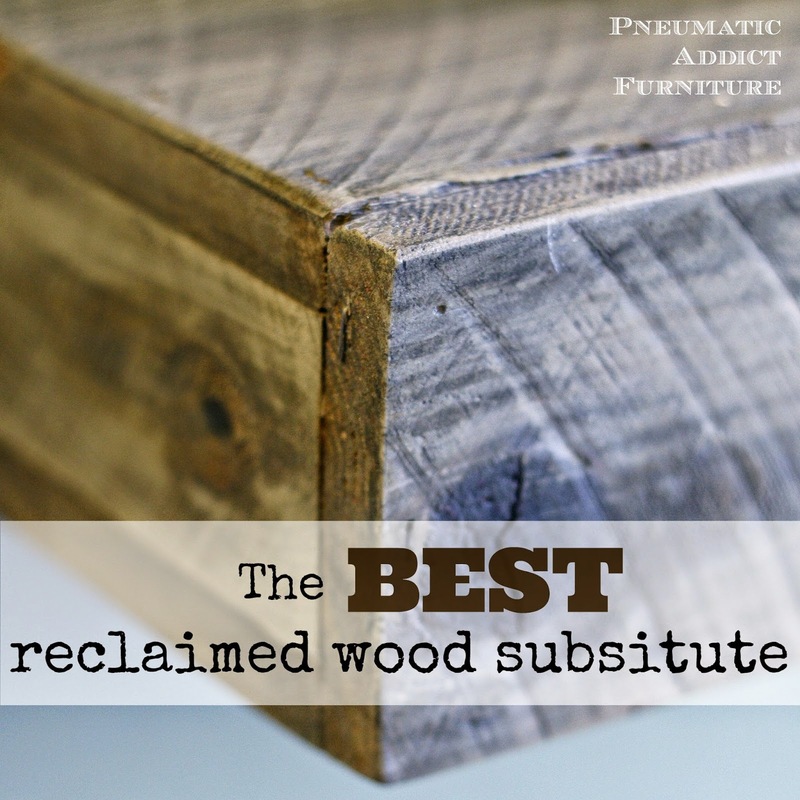 Don't have reclaimed wood readily accessible and B. Are too big of a cheapskate to buy it even if you could. Don't worry, I've got a simple solution. 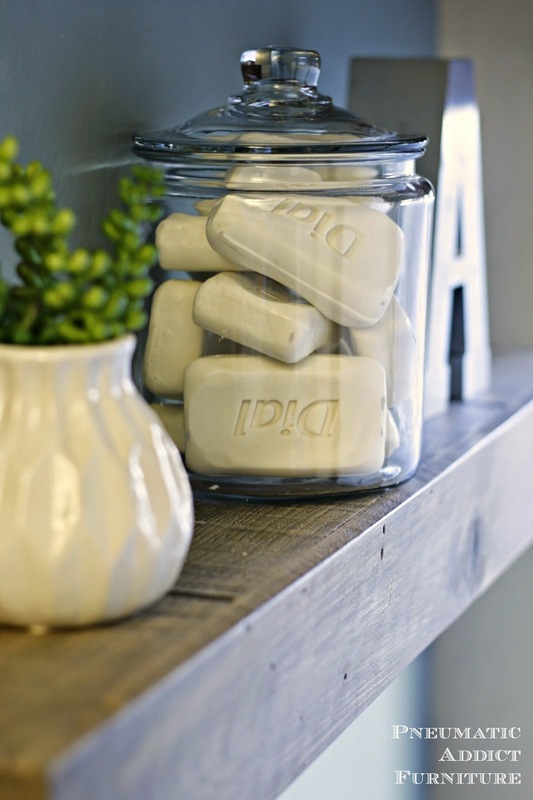 Pallet wood makes for a good reclaimed substitute, but then I guess you really are "reclaiming" it and it isn't faux. Anyhoo, have you ever ripped apart pallets before? Its horrible. Maybe worse than horrible. And even more sucky is that you typically end up with short lengths of wood. Now, I'm not putting down pallet wood. I myself have used it in the past, like for the wood crates in this tutorial. I'm just saying it isn't my first choice to get the "reclaimed" look. The top and shelf on my World Market coffee table knock-off. Or my latest project, faux reclaimed wood floating shelves. The fence boards have a nice, rough texture to them, just like pallet wood. The texture once painted, is great for outdoor applications, because all the little cracks and crevices soak up the paint and keep it from chipping off and exposing the bare wood. The trick to make them look truly old and reclaimed is in how you finish them. 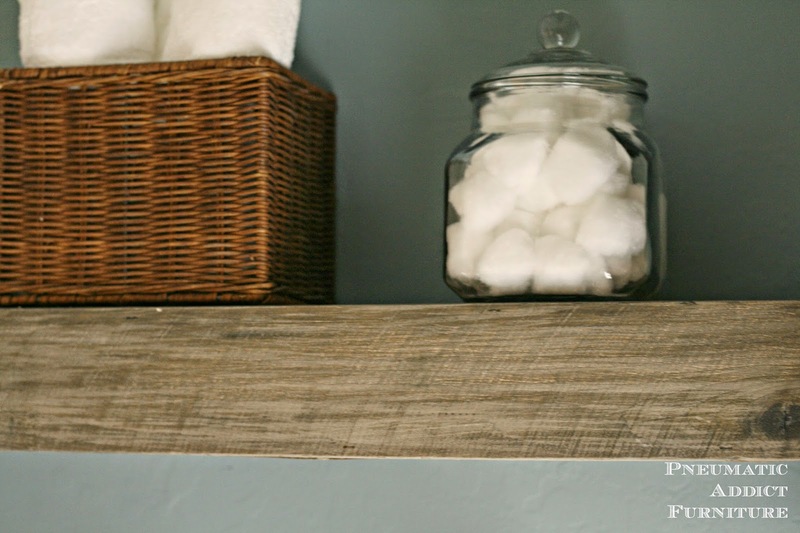 For these shelves, I used my weathered wood finish (tutorial here). Once again, the rough texture works in your favor. Although I haven't seen fence boards in lengths longer than 6 feet, both Home Depot and Lowe's carry both 1 x 4 and 1 x 6 widths. They usually have a good supply stacked up in the fencing section. What do you think? Better than paying an arm and leg for an old piece of termite food? You shelves look awesome! Great idea to use fence wood, and your finish technique is awesome! I agree taking apart pallets is super crappy, until I got my sawzall, then it was a breeze....but not everyone has one, so this a great alternative! Pinned! Do you use the pressure treated boards? It seems to be all that I can find. I am concerned if the pressure treatment would change how the wood takes stain. Avoid working with pressure treated wood as much as possible! Yes, you are right, the treatment would prevent them from accepting stain, but more importantly, the chemicals used in the treatment process are highly toxic! My husband is a carpenter and an engineering student. He wrote a research paper on pressure treated lumber. Its some scary stuff! The board I used are just rough sawed pine and they are readily available in my area. Redwood or cedar is also very common, but a bit more expensive and much more tricky to stain. Substitute*, just FYI. These projects look really great; nice job. Oh my gosh! Yes, I am such a dummy! Thank you. The floating shelves are beautiful!! Would you please tell me the dimensions and type of wood you covered with the fence boards? Also can you provide details on how you hung them? Thank you! Sure Julie! I'm writing a blog post about them and I should have it up by the end of the week. Hi Pneumatic Addict, were you able to finish that blog post? My mom and I are wanting to make these fence wood shelves but bracketed. And I never thought to use fence boards...Our Lowes carry them in the garden section & I never once thought about using them..Great tip! 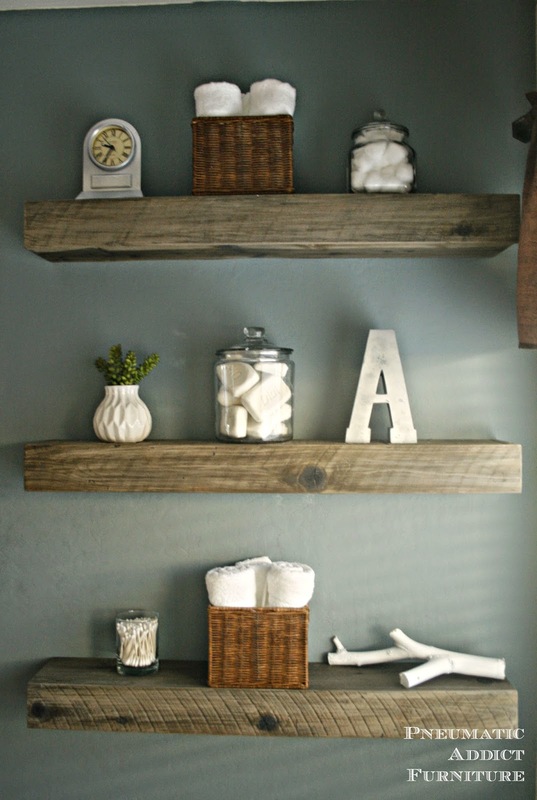 Hi Would you happen to have the tutorial to your faux reclaimed wood floating shelves seen here? 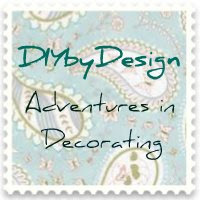 I didn't write my own tutorial, but this one is very close to how I build mine http://www.shanty-2-chic.com/2014/01/easy-diy-floating-shelves.html . Good luck! That looks beautiful! One of the biggest advantages of using reclaimed wood flooring or wood such as Real Wood Engineered Flooring is that it is environmentally friendly. This wood flooring is created from sources that does not require trees to be cut down. With other types of wood flooring, manufacturers have to cut down many trees to support production. With reclaimed wood flooring, it is basically like you are recycling.